The sale of so-called "fully loaded Kodi boxes" has been called a "top priority" by the Federation Against Copyright Theft (Fact). Kodi is free software built by volunteers to bring videos, music, games and photographs together in one easy-to-use application. Some shops sell legal set-top boxes and TV sticks, often called Kodi boxes, preloaded with the software. The developers behind Kodi say their software does not contain any content of its own and is designed to play legally owned media or content "freely available" on the internet. However, the software can be modified with third-party add-ons that provide access to pirated copies of films and TV series, or free access to subscription television channels. The sale of these so-called "fully loaded" boxes is currently the subject of a legal test. The five arrests were made in Bolton, Bootle, Cheadle, Manchester and Rhyl. 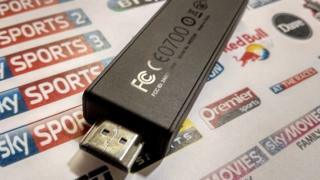 Kieron Sharp, director general of Fact, said the arrests "should send out a clear warning to anyone involved in the sale and distribution of illegal set-top boxes". "Set-top boxes loaded with apps and add-ons allowing access to copyright infringing material are very much illegal and anyone involved in selling these boxes should not be surprised to receive a knock on the door," he said. Fact said it had co-ordinated its "day of action" on behalf of the Premier League and subscription television providers BT, Sky and Virgin Media. The five have been released on bail following questioning.